Domain Modelling is a pre-process to classify the raw data into a modeled data for human or expert to make a further process. Unfortunately, domain modelling scheme might be changeable due to the environment change and expert experience. Server monitoring system is an example and used for the experiment. Server monitoring system is operated in varied environment and re-quire different domain modelling scheme for each environment. 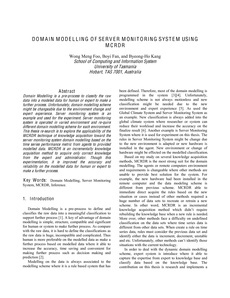 This thesis re-search is to explore the applicability of the MCRDR technique of knowledge acquisition toward the server monitoring system domain modelling based on the time series performance metric from agents to provided modelled data. MCRDR is an incrementally knowledge acquisition method to acquire only correct knowledge from the expert and administrator. Though this experimentation, it is improved the accuracy and reliability on the modelled data for human or expert to make a further process.